The end is in sight for the sale of Hornsey Town Hall, and Crouch End is now only a few weeks away from Haringey Council’s decision to approve a preferred developer – at least we hope that things are still set fair, as the post-Brexit turbulence in the property world may have put the wind up. In the spirit of positive civic engagement, the Neighbourhood Forum wrote to the council and posed a few questions about the process and the project (the full text of the letter is here). Councillor Alan Strickland, the Cabinet Member for Housing, Regeneration and Planning, was good enough to respond in straightforward and informative fashion. The text is below, and the full letter here. We also blogged an update on the procurement last month. The councillor’s letter confirms that the key events are the confirmation of the preferred bidder and the subsequent awarding of the contract – the moments when the Council exit the scene and the developer takes the reins. Only then will Crouch End learn of the new project, the shape of the residential build, and the opportunities for the local community to share their opinions. Better late than never? We’ll let you decide. Alas the lack of transparency in this process continues, and without sight of the key covenants in the 125 year lease, it will continue still. It is certainly disappointing that the bidders’ ideas about linking the development to improvements for the economy and infrastructure of Crouch End may remain unpublished. We think the local community have a keen interest here and could play a productive role, so we’ll continue to press for a wide consultation. Happily the councillor does confirm that the preferred bidder may choose to set up a governance structure which includes community involvement. – and yes, we still place our trust in the stated desire of Haringey to deliver “an interesting, lively focal point for Crouch End… a viable and vibrant mix of community, cultural, arts, leisure, business and residential uses”. Thank you for your letter dated 7th June. Firstly, I would like to re-assure you that Haringey absolutely recognises the importance of the Neighbourhood Forum within the community. The limited direct communication with the Neighbourhood Forum regarding this specific project is because there is no news to currently share, as the procurement process to secure a long-term future for the Town Hall is progressing. Haringey has clearly set out its objectives for the project and will ensure legal agreements are in place with the preferred bidder which reflect the principles agreed through the procurement process. The Neighbourhood Forum will not have a role in the procurement process and until receipt of your letter this is not something I have seen requested. Bidders are asked within their tender to set out how they will engage with stakeholders (this is a scored question) if they are selected as the preferred bidder, therefore engagement through the development works and longer term will be specific to how each bidder wishes to engage. 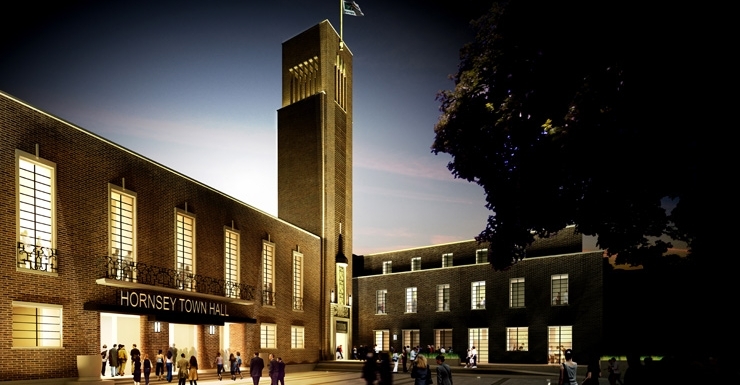 Community involvement through a public procurement process is almost unprecedented; however Haringey has worked in partnership with the Hornsey Town Hall Creative Trust (HTHCT) for many years to try to find a solution to this complex project. Therefore HTHCT have entered into confidentiality agreements to be a part of the project and evaluation team for the community access and use elements of the tender. This is not something which can be made available during the procurement process. Subject to compliance with procurement regulations, some details may be shared after the preferred bidder is selected. No – CIL funding can only be applied to strategic infrastructure projects as set out in Haringey’s section 123 list and Hornsey Town Hall does not fall into this category. Once selected, the successful bidder will determine their own engagement strategy. However, we would expect that they would want to engage with the full range of local stakeholders, including the Forum. As set out above, stakeholder engagement is a part of the evaluation and the preferred bidder will implement their own strategy for engagement and consultation. The preferred bidder may choose to set up a governance structure which includes community involvement in a working group. The preferred bidder has not been selected so we cannot confirm details of their engagement strategy. The exact nature of community engagement can be properly discussed once a bidder is selected. These are commercially sensitive documents and therefore strictly confidential. Haringey will remain the landlord of the site and therefore oversee the legal agreements. This procurement process has been set up to find a solution for the project and therefore decision making will be in line with the procurement process. As mentioned many times already, the preferred bidder will have their own engagement strategy and also their own governance model which include community representation on a working group; however this will not be determined until we have selected a preferred bidder.